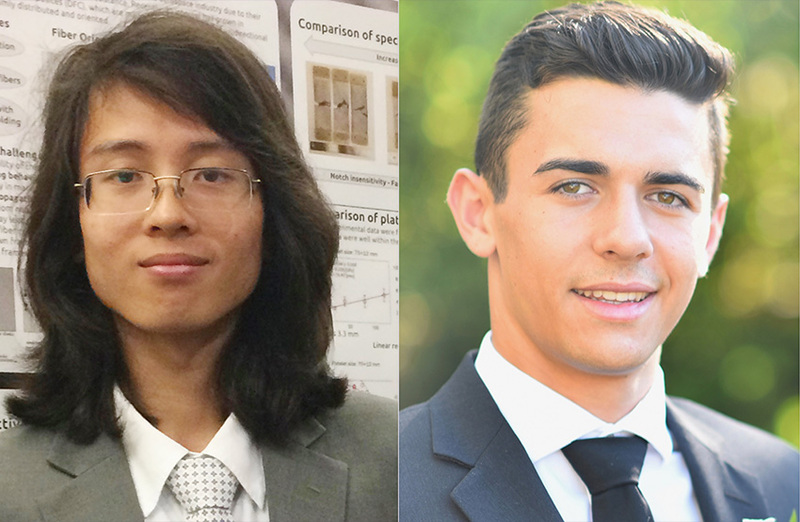 Minh Nguyen, A&A Senior, and John Buffalo, a Junior in Mechanical Engineering, were both selected as Mary Gates Research Scholars for this past academic year. Both students work with A&A Professor Marco Salviato in the Laboratory for Multiscale Analysis of Materials and Structures. The Mary Gates Scholars Program awards $5000 grants to 160 students from across the University each year who are working to advance Leadership, Research, or Innovation. For Minh and John, these grants are enabling them to dig deeper into an important research question. Minh was selected for his research into Discontinuous Fiber Composites (DFCs) for the next-generation aerospace infrastructure and wind energy production. John, who is the lead of the UW structural design team competing for the Space X Hyperloop competition, was selected to advance his research on the design of transportation infrastructure based on lightweight composite materials.